Christina Aguilera performed live Friday morning on "The Early Show" as part of our "Early Summer Concert Series" lineup. Aguilera kicked off her performances this morning with her hit single "Not Myself Tonight" off of her new album "Bionic," which is currently in stores. Since her debut album in 1999, Aguilera has sold over 30 million albums with four billboard topping hits. The five-time Grammy Award winning artist is also the only artist under the age of 30 to be featured on "Rolling Stone's" Top 100 Singers of All Time. Fans could not get enough as she took a walk down memory lane with a medley of "Genie in a Bottle" combined with "What A Girl Wants." 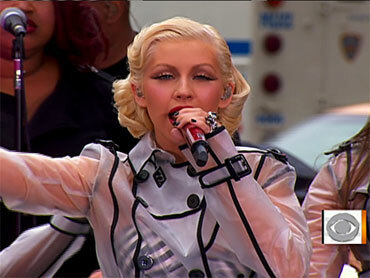 Aguilera has changed her style often over the years, and concerning her new album "Bionic" the singer said she was "inspired by electronic music. It's really fun. ... I got in touch with my initial pop roots and wanted to make a fun record with an electronic and sophisticated twist." Showing off her different artistic dimensions, Aguilera mentioned her debut on the silver screen this November in a film called "Burlesque." She changed the pace and continued her performance with a sultry-soulful piece "You Lost Me," also from her new album. Aguilera took a break to tell co-anchor Julie Chen about her work as a United Nations Ambassador and her work with the World Food Program(WFP). The singer closed out the show with a full out performance of an old hit that shows that she indeed is a "Fighter."